Watauga County Leads The Movement Toward Compassionate Schools In N.C. Article by Kaitlin Phillips, Editor of the North Carolina Medical Journal, and reprinted by permission from Watauga County School System. Morrisville, NC — Adverse experiences in childhood can lead to many negative health outcomes later in life, but for many kids the problems can start much earlier. In the current issue of the North Carolina Medical Journal, Denise Presnell, a school social worker, writes about efforts in Watauga County to address childhood trauma. Presnell begins her article with a startling statistic: one out of every four children in the classroom has been exposed to trauma, from divorce to abuse, that might make it difficult for them to learn. To address this problem, Presnell rallied her fellow faculty at a school in Watauga County where she had worked for 20 years and implemented a plan to make every school in the county a Compassionate School. This involved the creation of a Compassionate Care Team that included members of the Juvenile Crime Prevention Council, the Watauga Children’s Agenda and the local Interagency Coordinating Council. The team has facilitated many trainings for teachers and other school system employees, as well as a public-facing event, the “State of the Child Forum,” which took place in May 2017 and included representatives from the media, law enforcement, education systems, the medical community, parents, the faith community, political figures and more members of the community. 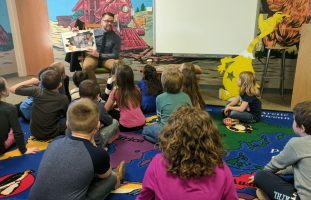 One of the most effective programs to come out of the Compassionate Schools initiative in Watauga has been the Silent Mentor program, in which nearly every adult in the building at Presnell’s school was matched to a student to speak to at least once per week. Watauga County Schools is now planning a “State of the Child, State of the Community Forum” for later this year, and area health departments involved in last year’s forum hold monthly meetings of the Watauga Compassionate Community Initiative. To read the full article, “Preventing and Treating Trauma, Building Resiliency: The Movement Toward Compassionate Schools in Watauga County, North Carolina,” by Denise Presnell, as well as other NCMJ articles, visit ncmedicaljournal.com. Watauga County Schools Director of Instructional Services, Ike Smith, reads to a first grade classroom at Mabel School.